Swimmers, take your marks…the SDHS swim team is assisting the Worcester County fourth grade swim program at the Ocean Pines Sports Core Pool. The goal of the program is to help students gain access to safety instruction and basic swimming skills. This unique opportunity started May 8 and continues until May 24. This allows the “team to build a strong relationship with our community and to foster the love of swimming in our county’s youth” varsity swim coach Mary Hathaway shared. Sophomore Delaney Williams expressed her thoughts on the program, and shared her experience. “It was very fun to help out with the program, and it was a neat experience. It was nice to do it for the first time, and going into it I didn’t know much about it, but it met my expectations,” Williams explained. “When we were helping out the kids, they took in what we were telling them, and they had fun while doing it. I think if they stick to it, and keep doing what they are doing, then I do think it will be a lasting program,” Williams further explained. “We taught them basic water safety skills, like what to do if they get caught in a riptide, and how to get out of it. 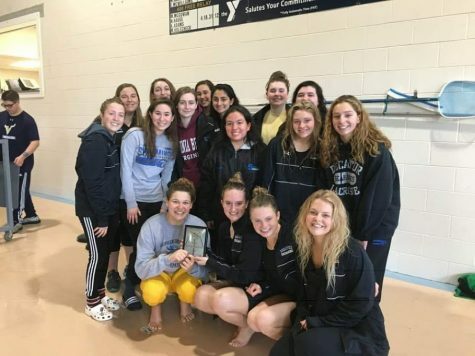 I thought most of the kids would know how to swim, but when we got there, it seemed like half the kids didn’t really know how to swim, and that they were never taught,” senior Fallon Brown stated. “I think the outcome was great. Most of the kids who went in not knowing how to swim, were not taught how to float, didn’t know how to tread water, or get out of bad situations, learned something. I do think it should be a lasting program, because every kid should know how to get out of a scary situation,” Brown continued.